Fig. 6. 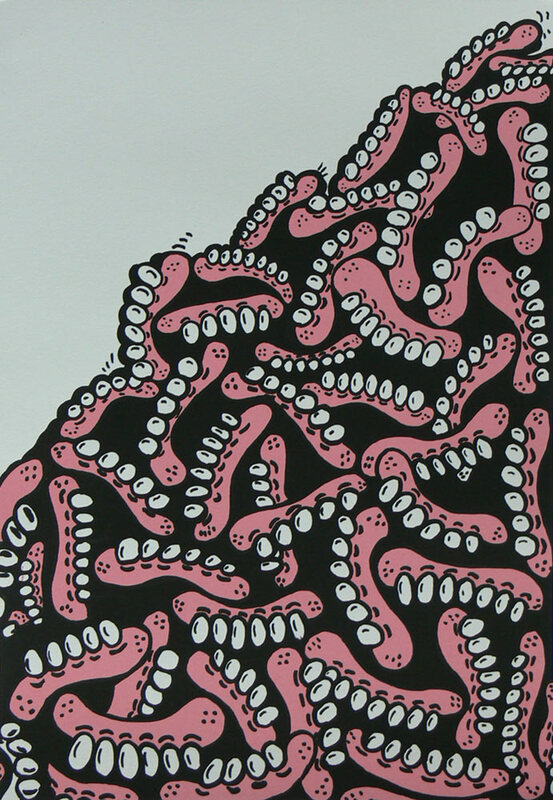 Ben Eine, Scary (2008), screenprint, 30 x 80 cm. The Victoria and Albert Museum, no. E.319-2010, ©Eine. Graffiti, street art, and their printed progeny, now ubiquitous, may appear to have sprung fully formed from the spray cans and stencils wielded by a new breed of artist, operating outside the system and eschewing the traditions. But like any other art form, street art has a rich vocabulary of sources and precedents. Its motifs, graphic styles and references are drawn, wittingly or otherwise, from sources as various as skateboard culture, album covers, comics, film, protest posters and ‘60s psychedelia, Mexican Day of the Dead ephemera, Renaissance vanitas and danse macabre imagery, printed ballads, broadsides and caricatures, and the work of artist printmakers down the centuries. Fig. 1. Robert Dighton, A Windy Day—Scene outside the shop of Bowles, the printseller, in St Paul’s Churchyard (c.1785), watercolor, 32.5 x 25 cm. The Victoria and Albert Museum, no. D.843-1900. It is not only older print imagery and styles that serve as precedents, but an earlier print culture itself. Print has a long history as a public art, infiltrating the public arena and playing a part in the information exchange of the street. In the 17th and 18th centuries, itinerant sellers of ballads and broadsheets offered their wares on the street; such things were part of a public dialogue about newsworthy events, religious belief, morality, and politics. Cheap, accessible and topical, such prints were also disposable. Political and social satires in the form of cartoons and caricatures circulated in much the same way, and were also available from print-sellers. In 18th and 19th century London, the shop windows where newly published prints were displayed were a source of public entertainment for those who could not afford to buy, and even for those who were illiterate but could nevertheless recognize the monarch or politician lampooned in exaggerated guise. The interaction of prints and their audiences can be seen in George Woodward’s Caricature Curiosity of 1806, which shows a plump clergyman and a skinny volunteer officer studying their own caricatured portraits in the window of what is probably William Holland’s shop (Holland published the print)—the former is outraged, the latter is flattered.1 An anonymous caricature (attributed to Bartolozzi) shows the window of Matthew Darly’s shop in which prints were under violent attack from the drawing master, printseller and caricaturist William Austin, who was offended to find himself the subject of a print mocking his ambition.2 Robert Dighton’s charming watercolour of a windy day in St Paul’s Churchyard shows a crowd tumbled and tossed by gusts of wind, against the backdrop of Bowles’ print shop, its window plastered with rows of prints (Fig. 1). In the 19th century, with the appearance of letterpress posters and notices and the rise of lithographic advertising posters, print enjoyed an increasingly dominant presence in public spaces. By the later 20th century this presence was perceived to be oppressive as advertising sites multiplied in number and size. This period also saw, alongside the proliferation of corporate advertising, a subversive, unsanctioned colonization of public space by flyposted posters. These came from varied sources—the indie music scene, political campaigners, countercultural groups, artists—who perceived fly-posting as an effective strategy for the anonymous, the impoverished, or the illegal. The tactic has been adopted by those who have no public voice, no public forum, and by those ranged against entrenched economic or institutional power. Some artists have resorted to flyposting precisely because gallery spaces are closed to them, or because they want to subvert the values and assumptions of the institutional space, or because they wish to thwart private or individual ownership of their work. Fig. 2. 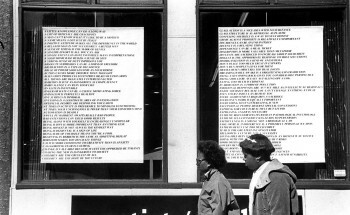 Jenny Holzer, from Truisms (1977-79), posters installed in windows of Printed Matter, New York, ©2011 Jenny Holzer, member Artist Rights Society (ARS), image courtesy Jenny Holzer/ Art Resource, NY. Some flyposting is done with specific political or social ends in mind: the New York activist group the Guerrilla Girls (Fig. 3) began their campaign against bias in the art world by fly-posting their messages around the city, as did the less well-known PESTS in a similar protest against the exclusion of African-American artists from mainstream galleries and sponsorship. Presaging contemporary street art, the PESTS devised a distinctive logo—a wasp-like insect whose armoury was enhanced by a pair of serrated pincers and a scorpion’s tail—that featured not only on their flyers, but also on a series of stickers.5 (Stickers have remained a popular format for contemporary street artists, enabling random acts of subversive collage and tagging.) For other artists, flyposting is a strategy for disrupting the routine public consumption of information. Flyposting printed material with enigmatic or provocative messages can work like the teaser campaigns employed by corporate bodies to build interest in a new product or an event. Whether the content is a graffiti tag or a product launch, the effects are cumulative and build to a critical mass of curiosity and awareness. Ben Eine, best known for his super-sized single letters on shop shutters and his prints and paintings of words and phrases, enjoys this tantalizing approach. When he first began to paint the single letters, he anticipated the questions they would invite: “Why? Who? What does it mean? Is it an advert?”6 Like many contemporary street artists, Eine works both by hand and through simple means of mechanical reproduction like stencils. Fig. 4. 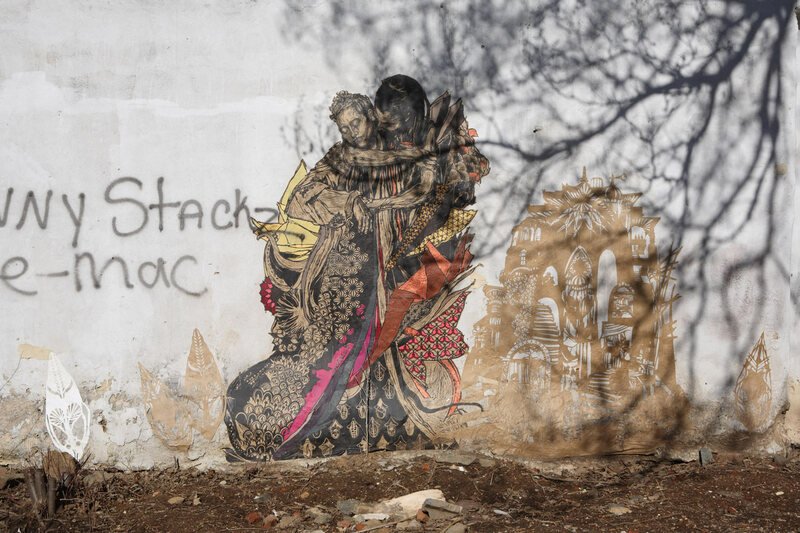 Swoon, Alixa and Naima (2008), blockprint with handcoloring and cut paper on exterior wall, Philadelphia. Building now demolished. Although street art is characterized by a rhetoric of resistance to corporate values and an implicit desire to subvert existing power structures, many artists operate simultaneously in the street and the gallery or museum. Like Kruger and Holzer, artists from Blek le Rat and Banksy to Eine, Swoon and Sweet Toof have proved to be surprisingly conventional when they have ventured into the marketplace with printed work. 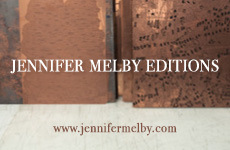 In almost every case they have adopted the traditional apparatus of printmaking and print marketing, producing signed and numbered limited editions. For the street artist, printmaking has been a positive development, offering a natural route to a sustainable creative practice. Work inscribed on walls and street furniture is inherently vulnerable and transient—likely to be erased by insensitive local authorities, overpainted, subject to the intervention of rivals, even demolished; prints on paper have a perverse longevity that the stencils, murals and paste-ups do not. Fig. 7. 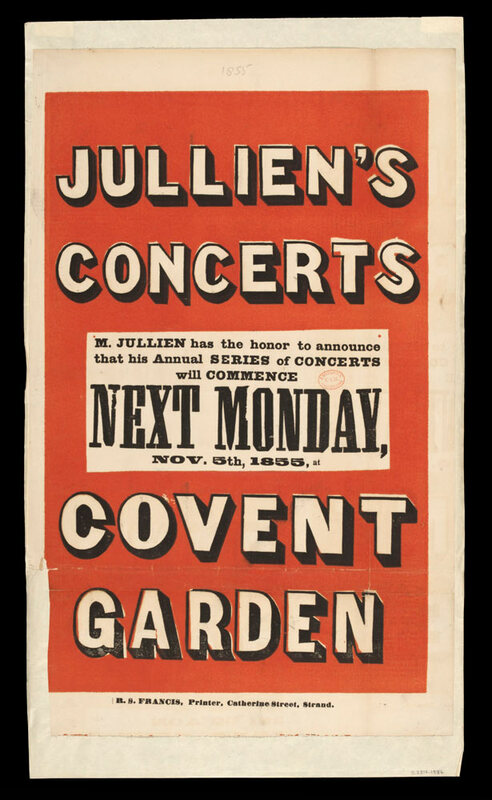 Poster advertising Jullien’s Concerts d’Ete at Royal Opera House, Covent Garden, London (November 1855), 49 x 28.3 cm. Published by R. S. Francis. The Victoria and Albert Museum, no. S.2516-1986. Fig. 8. Pure Evil, Frost on the Thames 1814 (2008), screenprint, 76 x 56 cm. The Victoria and Albert Museum, no, E.489-2009. Given by the Pure Evil Gallery, ©Pure Evil. Ben Eine’s practice is rooted in graffiti, but his work has mutated into a more socially acceptable manifestation of street art. As well as painting giant single letters in public places, he has made a number of large-scale murals (and also prints) of single words. Scary (Fig. 6) and Vandalism pun on the contrast between his own work, which is essentially decorative and cheering, and the uncontrolled excesses of old-school graffiti. 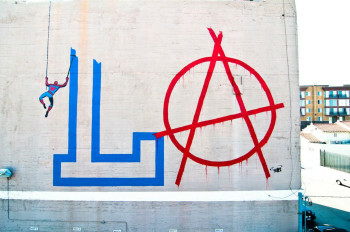 Authorities often claim that graffiti and street art (the differentiation is rarely made in this context) contribute to the fear of crime by suggesting lawlessness and disorder, but Eine’s brightly coloured and neatly painted typography is the antithesis of ‘writing’ and tagging. His colourful capital letters ultimately derive from the bold and distinctive Victorian fonts used on posters for circuses, fair grounds, and theatrical entertainments. 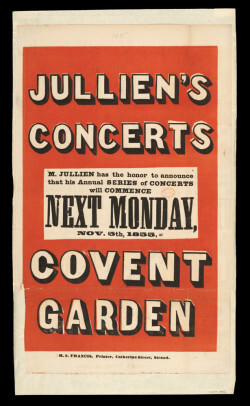 One typical example—an 1855 letterpress poster advertising a series of concerts at Covent Garden (Fig. 7)—shared with Eine’s Scary screenprint the use of 3D letter forms in black and white with an attention-grabbing red ground. Such posters were often produced for dramatic spectaculars such as the illusionist Rubini’s trademark act, ‘beheading a lady’, illustrated with extravagant relish in a poster of c.1869. Like Rubini’s poster, Eine’s print announces a potentially spine-chilling message in cheerful colours and a jaunty typeface. Pasting Services (c. 2000), screenprint: 61 x 45.8 cm. Victoria and Albert Muno. 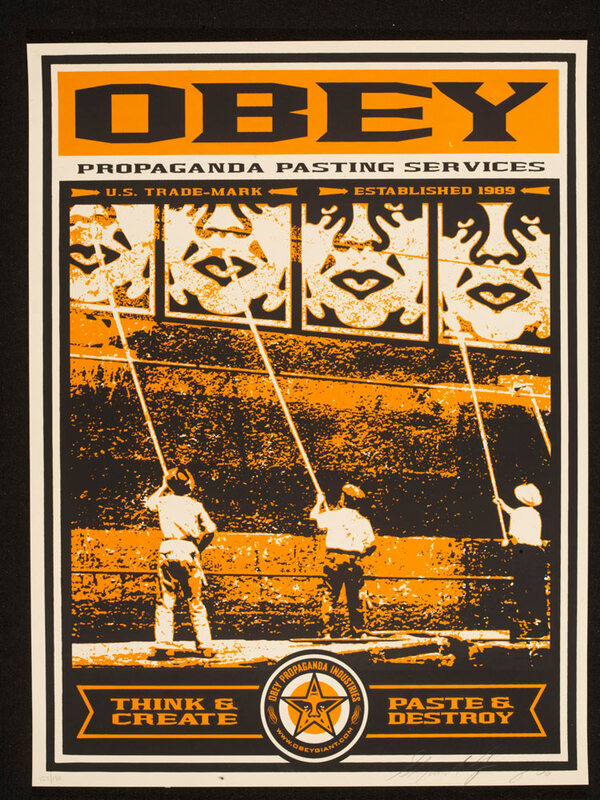 E.364-2006, ©Shepard Fairey. One motif has been almost ubiquitous throughout the history of popular printed imagery, from the 15th century to the 21st: the human delusion of dominion in the face of death. Traditionally the vanitas and the danse macabre demonstrated that social status—for which read celebrity in a contemporary context—has no power to resist the embrace of Death. One 17th-century example, engraved after Antoine Dieu, illustrates the point through a skeleton, elegantly shrouded in ermine-trimmed robes signifying wealth and privilege, who gestures pointedly to the words ‘dust to dust’ carved on a memorial stone (Fig. 10). More recently Jean-Michel Basquiat used skulls almost as a signature motif in his graffiti and paintings (he also made a series of lithographs inspired by the illustrations in Gray’s Anatomy, a book he had been given as a child and which was a powerful influence on his subject matter and his mixing of word and image. )14 Skulls and skeletons are used by contemporary street artists from The Krah to Kerry Roper and D*Face. Fig. 10. 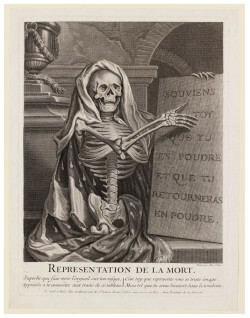 After Antoine Dieu, Representation de la Mort (18th century), engraving, 28 x 21 cm. The Victoria and Albert Museum, no. 25247. D*Face has also brought the vanitas form forward in prints that feature iconic portraits of celebrities—Warhol’s Marilyn, the sanctified freedom fighter Che Guevara (whose hero-ised image surely inspired Shepard Fairey’s noble Obama), John Lennon—but instead of glamour we are shown ‘the skull beneath the skin.’ It is an emblem of the Faustian pact with fame and history in which these figures enjoy an eternal after-life as the undead, endlessly circulated, endlessly consumed, and ceaselessly merchandised. This cycle is literally embodied in D*Face’s ‘collaboration’ with Queen Elizabeth II, in which her youthful face, as printed on banknotes, was reworked, leaving the familiar hair and tiara framing a grinning skull. In D*Face’s decomposing Marilyn we have the archetypal modern ‘vanitas’ in which an icon of perfected flesh, seductive youth and beauty, reflected in the mirror of public adoration, is shadowed by death. Fig. 11. 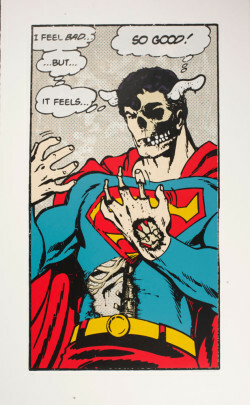 D*Face, Feels So Good (2008), color etching with nine color screenprint, 138.5 x 84 cm. The Victoria and Albert Museum, no. E.589-2009, given by the Black Rat Press, ©D*Face. The visual signature of British artist Sweet Toof is an assertive set of ‘pearly whites’, menacing or playful, but eternally grinning. They have been painted across building walls and printed on paper. They float disembodied like the Cheshire Cat’s smile, or leer from haunting faces, but the grin might equally be a grimace.16 Piled high (Fig. 12), the teeth make us smile but maybe wince too, with their allusions to the heaped skulls that memorialize 20th century atrocities from the Holocaust to the Rwandan genocide. Precedents for the graphic styles and motifs of contemporary street art abound, but we must resist the temptation to force these resemblances into definitive connections, or to see these affinities as direct evidence of influence. There are clear continuities in the concerns of popular culture across the centuries—a desire to level the playing field, to confront death, to speak truth to power, to enjoy a bit of mayhem. Some street artists are well-versed in art history, others are responding to, and building upon, visual archetypes that are deeply embedded in the culture at large. Street art is sourced most immediately in popular art forms—comics, film, music, urban youth cultures—and only more distantly related to fine art precursors. 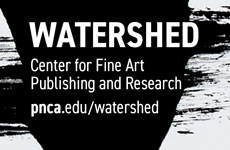 At the same time, contemporary artists have five centuries of printed matter available for sources and inspiration. In addition to hoarding posters, and vanitas subjects, there is Pop art, Punk, Surrealism, pyschedelia (and its precursor, Art Nouveau), all of which have made appearances, subverted or overlaid with a new sensibility. Lucy McLauchlan’s compositions with elongated faces and sweeping coils of hair and sinuous lines, predominantly in black and white, have a flavour of Aubrey Beardsley’s fin de siècle decadence replayed through the 1960s Art Nouveau revival.17 Russian Constructivist posters and chiaroscuro woodcuts are just two of the influences behind Shepard Fairey’s distinctive, and now much copied, graphic style. Fig. 12. 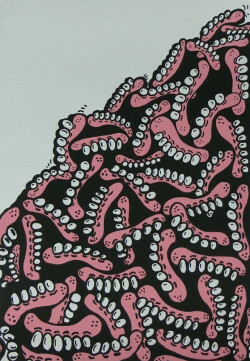 Sweet Toof, Pearly Whites (2009), screenprint, 49.5 x 34.4 cm. Victoria and Albert Museum, no. E.432-2009, ©Sweet Toof. Increasingly street artists themselves work in a number of different arenas, physical and virtual, indoors and out, legitimate and illegal. 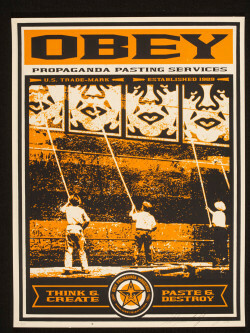 The use of print as a populist, market-unfriendly device (as in stencils applied to walls, or posters glued to buildings) has been augmented by the use of print as a market-ready device (no glue on the back). Some artists, such as Pure Evil, have taken the next step, and set up as gallerists and promoters in their own right. Indeed street art has been swiftly accommodated by the market, and co-opted by the ‘cool-hunters’ with a product to sell. 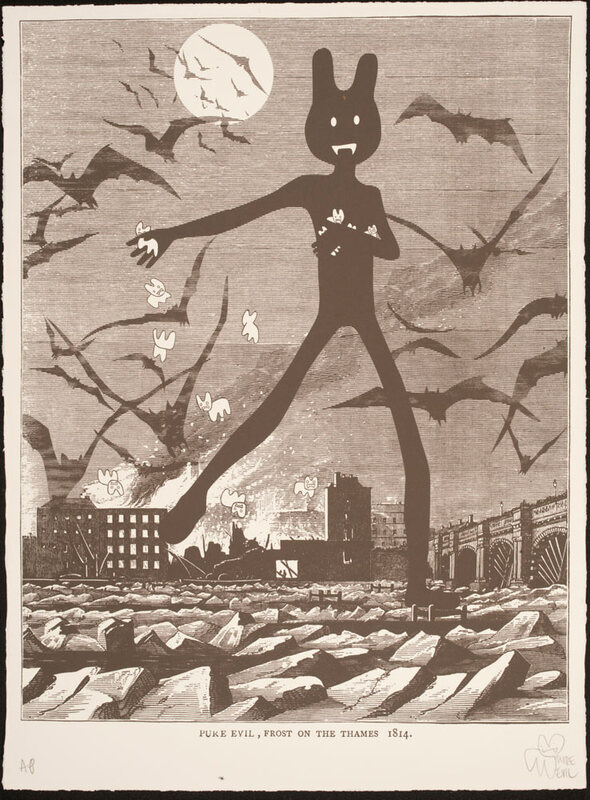 Through properly editioned, portable prints, what was once an edgy aesthetic has entered the mainstream, and auction sales of what, in market parlance, is termed ‘urban art’ have proliferated. It could be argued that, for all its confrontational energy, subversive intent and counter-cultural origins, street art has been domesticated by the adoption of print market practices: providing a material asset for the collector, and an exhibitable object for the museum. 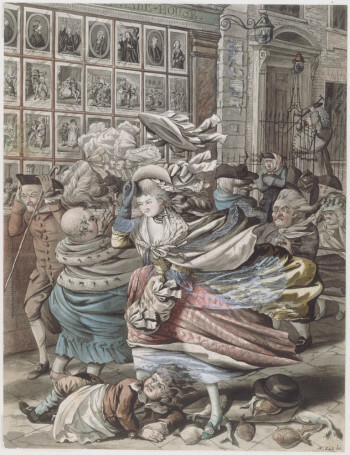 Nevertheless the anger, the wit, and the playful joie de vivre that first found expression on the streets remain a natural fit with the traditions of printmaking, which has always had the power to protest and disturb as well to entertain.